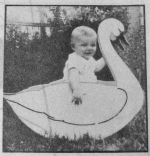 Home / Kids Toys & Furniture / Childrens Furniture Woodworking Plans for Projects / Swan Rocker Vintage Woodworking Plan. R-ANH1122 - Swan Rocker Vintage Woodworking Plan. Condition of this recycled plan: Excellent (priced as marked), we have one copy of this plan available. Plan is printed on one sheet of 17 x 22 inch paper. This is a vintage woodworking plan. Visit our FAQ page for a full definition. First project in woodworking I completed by myself. Thanks for the templates, made it an easy project for me.